Smash attack inputs with the four different control schemes in Super Smash Bros. Brawl. 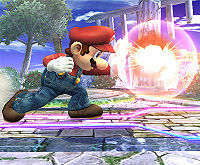 Mario's forward smash in Brawl, in which he sends out a powerful explosion from his hand, which does heavy damage and knockback. The namesake of the Super Smash Bros. series, a smash attack (スマッシュ攻撃) is a grounded move which is used to deal "finishing blows" to an opponent. It is performed by "tapping" the control stick and pressing the attack button at the same time. It can also be done by tapping the C-stick in the multi-player modes of Melee, or any mode in Brawl and SSB4. SSB4 also added the ability to charge a smash attack by holding a direction on the control stick and pressing the A and B buttons simultaneously. The three types of smashes are the forward smash, up smash and down smash. Despite the name, smash attacks are not related to Final Smashes. Smash attacks generally have higher knockback compared to other attacks in a character's arsenal. Uncharged smash attacks typically do around 13% to 24% damage varying on the character used. In every game since Melee, they can be charged by holding the buttons down, giving them more damage and knockback. A smash attack may be charged for up to 60 frames, or 1 second, although charging begins at different times depending on the move. A fully-charged smash attack does 1.3671× damage in Melee and 1.4× damage in Brawl, Smash 4, and Ultimate. For example, a smash attack that normally does 16% damage will do 21.8736% damage when fully charged in Melee, while it will do 22.4% fully charged in Brawl, Smash 4, and Ultimate. A character receives 1.2× additional knockback when hit while charging a smash attack (akin to the counter hit mechanic in other fighting games). Some forward smashes can be angled in the same way forward tilts can - depending on the angle and the attack, a different amount of damage may be dealt. Usually, smash attacks deal extra damage when angled up and less when angled down (usually a 1% or 2% difference), which the trade-off being the difficulty in hitting shorter targets when angled up. Angled smash attacks can have other properties as well, such as Luigi's forward smash gaining extra IASA frames when angled up in Brawl, or Little Mac's forward smash being totally different depending on where it is angled. Smash attacks are often powerful finishing moves and/or large attacks, however, they sometimes tend to be laggy: they usually come out slower than a neutral or tilted attacks, and have longer endlag, a prominent example being Palutena's smash attacks, which have notable startup lag and among the highest cooldown. However, there are a few exceptions to this rule, with notable examples being Pikachu's forward smash, Mario's up smash (except in SSB) and all of Little Mac's smash attacks. A character who spams smash attacks is easy to counter in most scenarios and all skill levels of play. As with any attack, the smash attack's power will also be affected with stale-move negation when it is overused. At the same time, frequently spamming via charging them at inappropriate times can also warrant increased knockback as aforementioned, which foes can easily use as an amplified and deadly punish. Battering items such as the Fan, Lip's Stick, or the Beam Sword have their own forward smash, and can also be charged (except for the Home-Run Bat). Using a smash attack to throw an item often deals more damage than simply tilt-throwing it. While smash attacks were introduced in the first game, they could not be charged. As such they were slightly less powerful overall than in subsequent games, where they can be charged to KO at lower percentages. Smash attacks can now be charged, dealing 1.3671× more damage when fully charged. In Versus mode, smashes can also be performed by pressing the C-stick in any direction (in single-player mode the C-stick controls the camera). Holding the Z button or A button while pressing the C-stick results in charging the smash. Since Brawl, smash attacks' damage multiplier have been rounded from 1.3671× to 1.4x, making them stronger. One can play the game with 4 different controller setups. While the Wii Remote, the Wii Remote and the Nunchuk, GameCube Controller, and the Classic Controller all have control sticks to perform Smash attacks the standard way, when using the Wii Controller on its side, one can also press the direction they are attacking and press both the 1 and 2 buttons at the same time. However, though it is stated in the photo, the 1 button is not required to perform a smash attack. When attacks are charged in Brawl, characters now move while flashing as opposed to just freezing then unleashing the attack. Like in Melee, a small sound can be heard when charging a smash attack. For most characters, it's the same cracking sound from Melee except much less dull, but Yoshi, Diddy Kong, Kirby, Pikachu, Ness, the Ice Climbers, Jigglypuff, Lucas, Olimar, Squirtle, and Wario-Man all make a squeaking noise instead. These characters are all cartoonish in appearance and all of them are lightweight (except for Yoshi and Wario-Man), but it is unknown exactly why these characters were given a special charge sound effect. Mr. Game & Watch adds echoing "beep" sound effects to his cracking sound when charging, and is the only character to compliment that sound effect. Wario does an attack similar to his shoulder bash from the Wario Land series. Mechanically, smash attacks seem virtually unchanged from the previous game; only aesthetic and control differences. Update 1.0.6 added the ability to charge smash attacks with the A + B buttons. A short drum beat used with many characters, with a few exceptions as listed below. A "twitter" sound shared by Yoshi, Diddy Kong, Kirby, Pikachu, Jigglypuff, Ness, Lucas, and Olimar. A "swishing" sound shared by Peach, Rosalina, Zelda, Zero Suit Samus, and Palutena. A "sharpening" sound shared by Link, Marth, Ike, Robin, Lucina, Roy, Cloud, Corrin, and Mii Swordfighter. Wii Fit Trainer uses the sound of a whistle for all smash attacks. Mr. Game & Watch adds the same echoing "beep" sound effect from Brawl, but makes no extra sound when charging smash attacks. Bowser Jr. uses the drum beat for all his smash attacks, but uses an additional sound effect for his forward smash attack. Mega Man uses the charging sound effect from Mega Man 5 for his forward smash, but the drum beat for his up and down smash attacks. Greninja's attacks all use the drum beat when charging, but an additional "high-speed flowing water" sound effect can be heard. Lucas uses the twitter sound effect for his smash attacks, but adds a unique PSI-charging sound effect for both his up and down smash attacks. Bayonetta uses a unique sound effect based on her home series. Battering item smash attacks can also sometimes change character sound effects. For example, Peach's changes to the drum beat, but Wii Fit Trainer's changes to the swish, and Villager's changes to the twittering. In Ultimate, smash attacks can still be charged for 1 second. However, they can also be held for an additional 2 seconds after that, not increasing their power any further, but allowing the attack to be held for a more controllable amount of time. It is clear from these exceptions that smashes that use projectiles or long-disjoint props are being balanced with lesser attributes. This page was last edited on March 4, 2019, at 10:34.